Tom Sawyer and Becky Thatcher lost in the cave. From the first edition of The Adventures of Tom Sawyer. Photo courtesy of Dave Thomson. A bat is beautifully soft and silky; I do not know any creature that is pleasanter to the touch or is more grateful for caressings, if offered in the right spirit. I know all about these coleoptera, because our great cave, three miles below Hannibal, was multitudinously stocked with them, and often I brought them home to amuse my mother with. It was easy to manage if it was a school day, because then I had ostensibly been to school and hadn't any bats. She was not a suspicious person, but full of trust and confidence; and when I said, "There's something in my coat pocket for you," she would put her hand in. But she always took it out again, herself; I didn't have to tell her. It was remarkable, the way she couldn't learn to like private bats. The more experience she had, the more she could not change her views. I think she was never in the cave in her life; but everybody else wentthere. Many excursion parties came from considerable distances up and down the river to visit the cave. It was miles in extent and was a tangled wilderness of narrow and lofty clefts and passages. 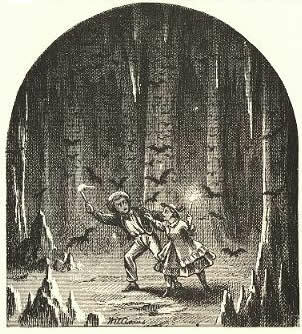 It was an easy place to get lost in; anybody could do it--including the bats. I got lost in it myself, along with a lady, and our last candle burned down to almost nothing before we glimpsed the search party's lights winding about in the distance. "Injun Joe," the half-breed, got lost in there once, and would have starved to death if the bats had run short. But there was no chance of that; there were myriads of them. He told me all his story. In the book called Tom Sawyer I starved him entirely to death in the cave, but that was in the interest of art; it never happened. "General" Gaines, who was our first town drunkard before Jimmy Finn got the place, was lost in there for the space of a week, and finally pushed his handkerchief out of a hole in a hilltop near Saverton, several miles down the river from the cave's mouth, and somebody saw it and dug him out. There is nothing the matter with his statistics except the handkerchief. I knew him for years and he hadn't any. But it could have been his nose. That would attract attention.